This pre-filter is the most permanent and economical pump pre-filter we offer. 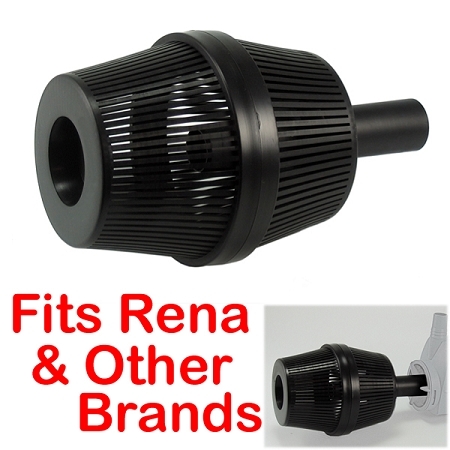 It will fit the Rena Flow or Pond Care models including RF350, RF450, 705C (350), 705D (450), RF850, RF1250, 705E (850), 705F (1250). The filter consists of three parts, 2 filter baskets that attach to each other to form the filter and a stem which attaches to the front of the pump. The filter is slotted and allows the free flow of water through the pumps while blocking larger particles of dirt or plant debris that might clog the pump. The unit is easily cleaned by unscrewing the two halves and using a soft brush or cloth to remove mineral deposits or algae growth. Made of light-weight, impact resistant plastic that will not corrode.